SOLD OUT! 2ND TOUR NOW ADDED - SEE WORKSHOPS & TOURS PAGE! 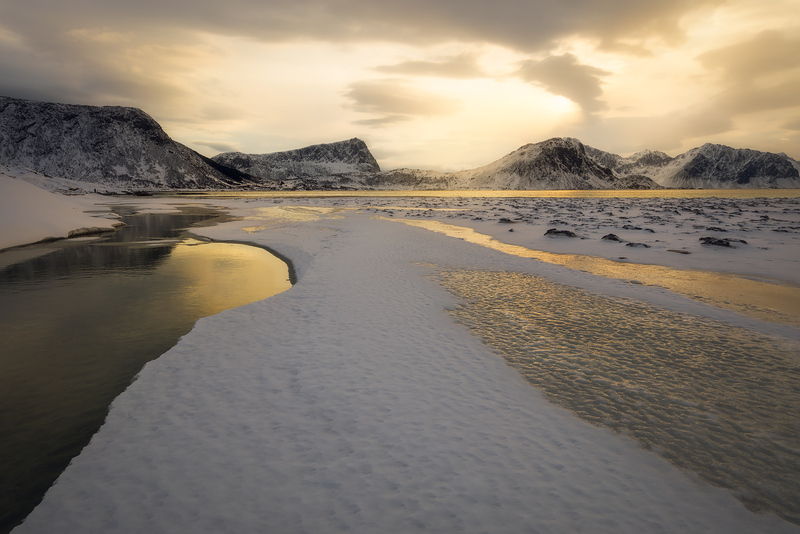 Winter in Lofoten, Norway has to be seen to be believed. You'll be up close with majestic fjords, snow-covered jagged mountains, icy blue water lakes, quaint fishing villages, and beautiful rocky shoreline. To top it off, the periods of low-angled sunlight can last for hours. Lenticular clouds are also common here. 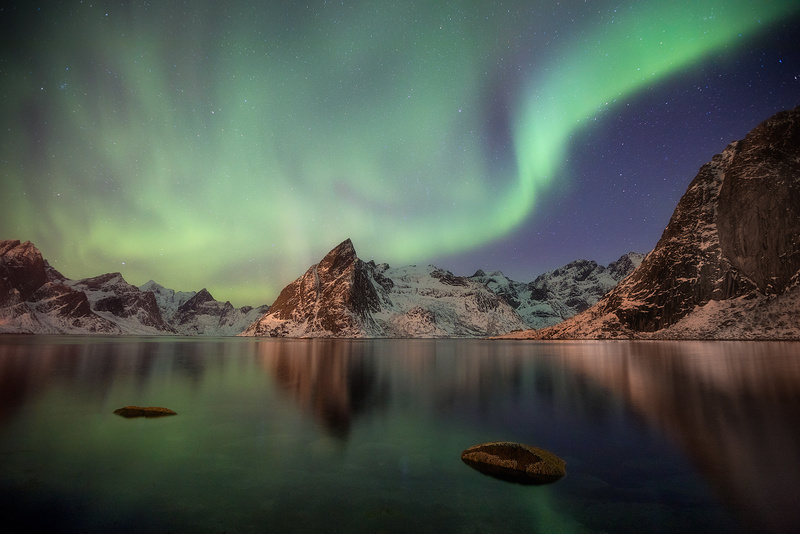 As if that wasn't enough, Lofoten is also known as one of the premiere places in the world for experiencing and capturing the Northern Lights. In order to make the most of this photo tour, I am limiting the group size to just 5 or 6 participants. 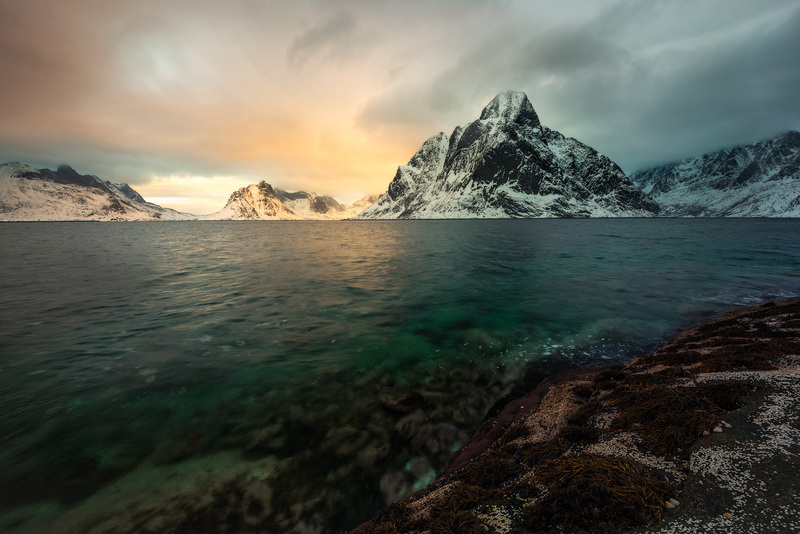 Together, we will explore Lofoten's best, including the classic locations around Leknes and Reine, as well as some lesser known spots that offer excellent foreground opportunities. The new moon happens on February 15th, meaning we will have the advantage of darker skies during this trip. 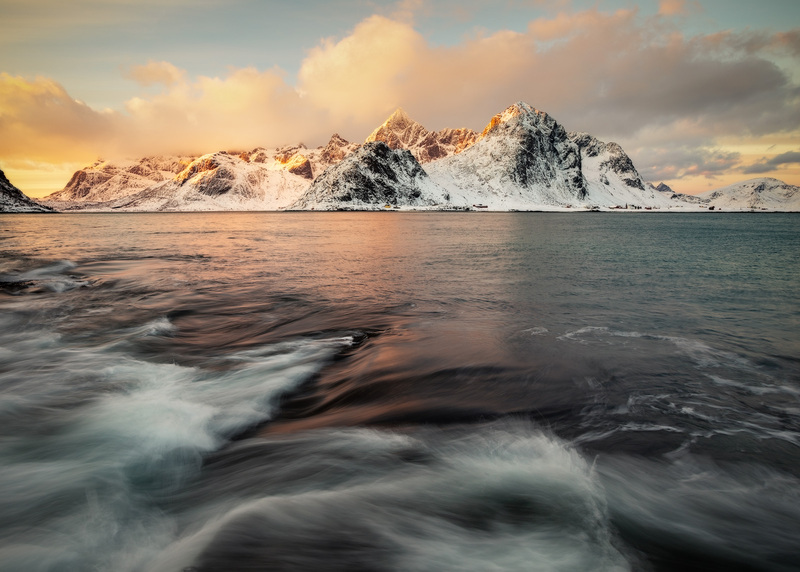 If you haven't experienced and photographed Lofoten during the Winter, this is your opportunity! Day 1, February 11, 2018 (Leknes) - Our adventure will begin in Leknes. I will meet you upon your arrival at the Leknes airport (airport code LKN) and bring you straight to the hotel. If you would like to fly in on February 10th to rest up, I'm happy to arrange, although the extra night's hotel costs will be at your own expense. On February 11th, we will meet in our hotel lobby at 6:00 pm for a welcome dinner and to talk about the upcoming tour. Although the plan is to get a good night's rest this evening, I will keep a close eye on the Aurora Borealis forecast and sky conditions, as I will be doing throughout the tour. If things look good for the Aurora this evening, we'll head out to capture it! Days 2-3, February 12-13, 2018 (Leknes) - Good light in Winter can last a long time... sometimes for hours. The most beautiful lighting I experienced in February 2017 started at 1:00 pm. Although we will be well-positioned at sunrise and sunset, we will also take advantage of favorable lighting conditions, even at mid-day. If the Aurora appears, we will be out photographing. Our shooting locations in Vestvågøy and Flakstadøya are relatively close by and do not require any long hiking. 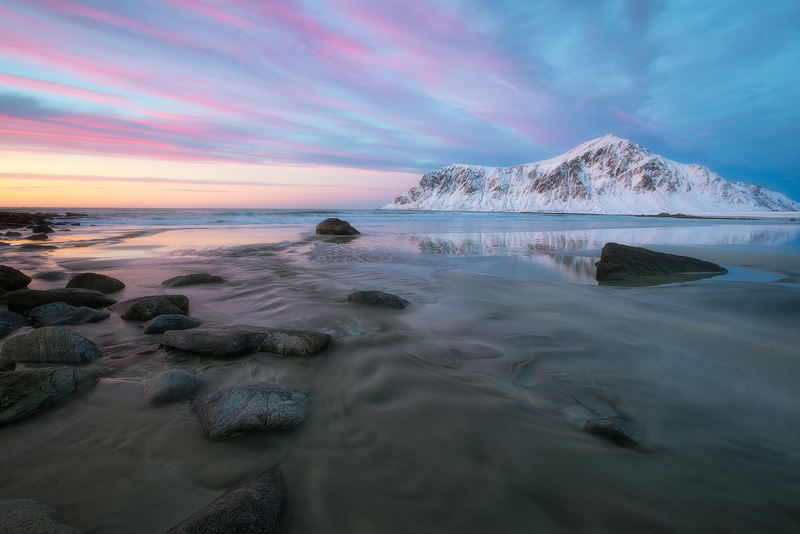 We will photograph the classic beaches and shorelines including Skagsanden, Haukland, Uttakleiv, and Vareid, as well as scout some lesser known places for ice patterns that can be used in the foreground. When weather becomes less interesting, we will use our time to cover a variety of basic and advanced landscape post-processing techniques. Days 4-6, February 14-16, 2018 (Hamnøy/Reine) - We will change locations after breakfast, basing ourselves 90 minutes away in Hamnøy, just outside of Reine. I've booked Superior Rooms for you in this beautiful location. One of the best Northern Lights photo opportunities is right outside your hotel. If the Aurora arrives, we can be set up and shooting in just minutes. In addition to some incredible landscape locations a short drive away, we will photograph the villages of Reine and Hamnøy with the majestic mountain peaks behind them. Although the trip is not yet over, we will enjoy a farewell dinner together on Friday evening. Day 7, February 17, 2018 (Hamnøy/Reine & Departure) - We will photograph a final sunrise near our hotel, grab breakfast, and then head back to Leknes where you can catch your afternoon outbound flight. This photo tour is open to photographers of all skill levels. The small group size allows me to spend more time with each participant. At minimum, however, you should be familiar with your camera's controls and understand the basics of composition. There is no need to worry if you do not have experience with night photography, as I will be teaching these techniques early in the tour. For night photography, you will get better results with a camera that can handle ISO's in the 1600-2000 range with relatively little noise. A wide-angle lens with an aperture of f/2.8 or wider is desirable. Contact me if you have any questions on this. You should bring lenses in the wide-angle through telephoto range to capture the myriad of photographic opportunities in this region. I will be teaching post-processing techniques in Photoshop and Lightroom, so bring your laptop. Bring enough memory cards... I suggest at least 100 gigs or more. Bring extra camera batteries and, as always, a tripod. 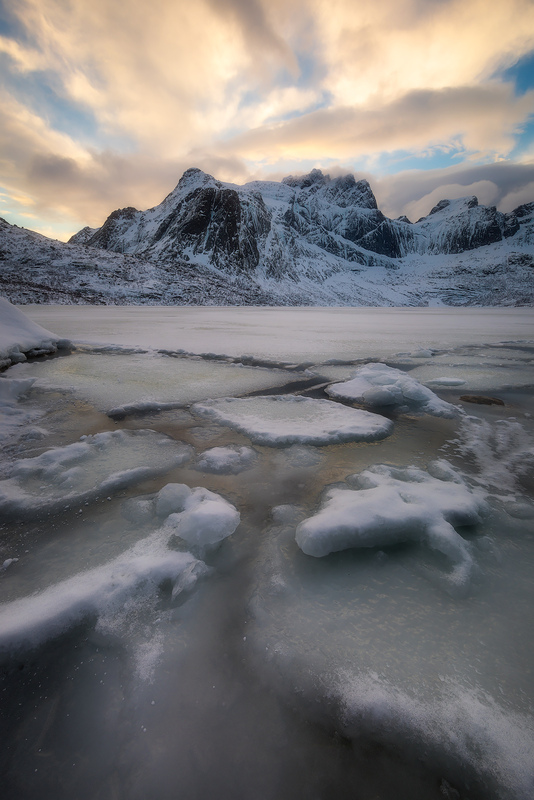 Lofoten is not as cold as you might think during February. In February 2016 and 2017, temperatures averaged around 31 degrees Fahrenheit (-0.4 Celsius), with lows of around 12 degrees Fahrenheit (-11 Celsius), not including windchil. So, you will likely experience temperatures slightly lower than freezing for much of the trip, with some dips below that. However, you will want to be prepared for cold weather. When outside, we will be within a short walking distance of our vehicle at almost all times. Making your air arrangements - For those of you flying in from the U.S. or Canada, I recommend the doing the following: 1) Buy a roundtrip ticket that arrives in Oslo, Norway Gardermoen airport (airport code OSL) on Saturday, February 10th, 2018. 2) Book a room the night of February 10th at Radisson Blu Airport Hotel, Oslo Gardermoen. You walk out the airport door and you are at the entrance to the hotel. 3) On February 11th, book the following flights on a single ticket (using Expedia, for example): SAS 4106 from OSL to BOO (Bodo), departing at 10:40 am arriving 12:10 pm. Then connecting with Wideroe 810 from BOO to Leknes (LKN) departing at 1:15 pm and arriving Leknes at 1:40 pm. If you would, instead, like to fly into Leknes a day early to rest up before the tour starts, then push those dates back by one day, arriving OSL on February 9th and flying OSL – LKN on February 10th. I can book your Leknes hotel for the extra night of the 10th, but it will be at your own expense. For your return travel, book your travel back to OSL on a single ticket as follows: Saturday, February 17th depart on Wideroe 810 out of Leknes (LKN) at 1:55 pm to Bodo (BOO) which makes a quick stop in Rost (RST) and arrives Bodo at 3:00 pm. Then, connect on SAS 4113 departing BOO at 4:15 pm and arriving OSL at 5:45 pm. Then, unless you have the option of a late flight out of OSL back home on February 17th, you can again have a good night’s rest at the airport hotel again and have your return out of OSL on February 18th. Upon your arrival in Leknes, I will meet you at the airport on February 11th (or February 10th if you choose to arrive a day early) and bring you to the hotel. As mentioned, the group will meet for a welcome dinner at 6:00 PM at the lobby of our hotel in Leknes on February 11. Our Leknes hotel is a couple hundred meters' walk from a coffee shop and stores. As for local transportation, we will travel in a 9-person van and be doing relatively short drives, up to 90 minutes maximum. The roads are generally well-kept. There will be no long hikes on this trip. 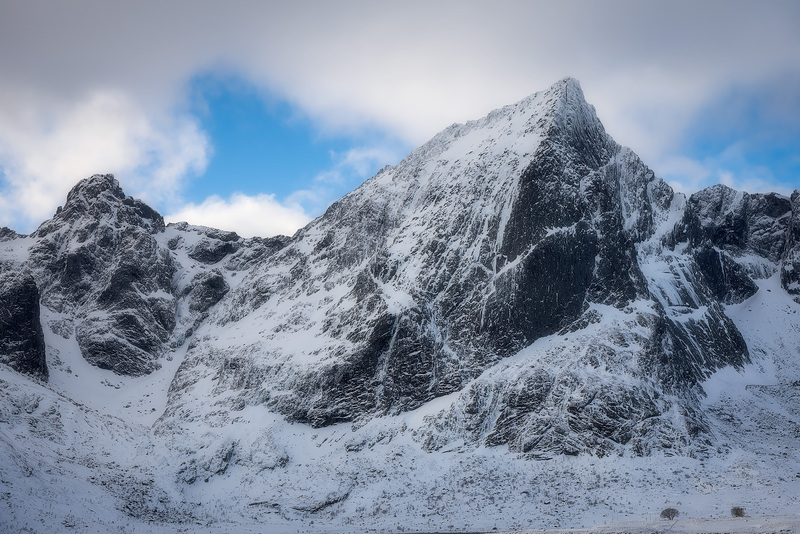 Generally, we will be walking very short distances on snow-covered paths which are sometimes at an incline, as well as positioning ourselves on potentially slippery rocks, snow and ice. So, having good balance and the ability to walk up and down an incline (such as from a parking lot down to the shore) in snowy conditions is important. I strongly suggest you purchase emergency medical treatment and medical evacuation insurance for this trip. *Because of the small group size, booking a shared room is only possible if you are booking the tour with someone that you will be sharing a room with. Price Includes - Accommodations (sharing or single as noted above), welcome dinner and farewell dinner, all breakfasts, all local transportation including airport transfer, photo instruction & critiques. Price Does Not Include - Everything not noted as included, such as airfare, passport and visa costs, lunches, dinners other than welcome and farewell dinner, travel insurance, alcohol. After reviewing the tour info and policies, please fill out & sign the tour registration form and then contact me via the contact form. You can pay the deposit using using the button below (this is only the deposit amount) or you can mail me a check if you prefer.